Yokogawa's representative in Florida, Classic Controls, Inc., successfully installed an integrated SCADA system that included a CENTUM CS 3000 distributed control system, FA-M3 multi-controllers for RTU, UT55A digital indicating controllers, FOUNDATION fieldbus devices, and the Plant Resource Manager (PRM) package. The West Mitchell Hammock facility operates around the clock 365 days a year. In the event of a problem such as a loss of pressure, the A.M. Jones facility, located four miles away, will automatically begin supplying water to the municipal water system. Via a radio link, operators in the main control room at the West Mitchell Hammock facility can monitor the situation at the A.M. Jones facility on two large screens and are able to take immediate action whenever additional water must be supplied. Regarding the ITV locations, the City can monitor their West Mitchell Hammock Water Treatment Facility through remotely operated cameras. The AM Jones re-pump station has an alarm system with cameras but it is monitored by a security company. The security company calls the operators when there is an incident. Within the West Mitchell Hammock facility, main system controllers with dual redundant CPUs are located at high service pumps in the chemical injection*1 and aeration*2 areas, and are linked via dual redundant fiber optic cable. FOUNDATION fieldbus-enabled instruments for each process are linked to the CS 3000 control system, allowing all process data to be monitored from graphic displays in the central control room. Operators are kept constantly apprised of the status and conditions of systems and equipment throughout these plants, and are able to take quick and decisive action to keep everything running smoothly and safely. System modifications are occasionally required to improve some aspect of plant operations. 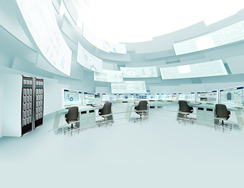 The engineering office at Classic Controls is located approximately 100 miles from this facility, so secure remote access to the entire system was implemented. Modifications can be executed from the representative's office and uploaded to the system. This remote engineering support significantly reduces travel time. To reduce maintenance costs, the engineering team at the Oviedo water treatment plant decided to use FOUNDATION fieldbus devices and the PRM package. This allows operators and engineers at the engineering office to continually monitor the status of all field devices, eliminating the need for visual on-site checks. The use of the FOUNDATION fieldbus technology also reduces the amount of engineering that needs to be done when a transmitter is replaced. "We are very pleased to be using Yokogawa's highly reliable CS 3000 and FA-M3 systems, UT55A controllers, and FOUNDATION fieldbus devices at this facility. We appreciate the great support from Classic Controls. Their ability to take care of the control system and the field devices is excellent, and we always welcome the opportunity to work with them," said Steve Medeiros, manager of the West Mitchell Hammock facility. Classic Controls, Inc. of Lakeland, Florida provides total solutions, from systems engineering, selection of instrumentation, and process design to system installation and operator training. In terms of systems engineering, this integrator is one of the most capable Yokogawa representatives in the US. Monochloramines inhibit the formation of trihalomethane (THM) compounds, which are thought to be carcinogenic. Monochloramines have a longer lasting CL2 residual, reducing the need for booster stations in remote areas served by the city water system. Although Oviedo had been using the monochloramine disinfection method for many years, its water quality has improved since the Yokogawa system took over control of the dosing process. Customer complaints about water quality have dropped to nearly zero since the new system was implemented. The aeration process at the West Mitchell Hammock facility is preceded by CO2 injection to reduce the pH of the well water from around 7.8 to 6.5. The lower pH level allows the aeration process to be more efficient at removing the H2S. When the water enters the aeration tank it is met with airflow from a blower that is counter-current to the water flow. Plastic media are used in the aeration vessel to disperse the air and water. The aeration process strips the H2S from the water, and the gas is directed to stripping towers where a sodium hydroxide solution is passed through it to return it to liquid form for disposal in the sewer. This scrubbing system is important because, without it, the foul smelling and toxic H2S gas would be emitted into the air. As the solution is passed to the sewer it is dosed with sulfuric acid to decrease the pH from around 10 to 7. Without the aeration process to remove the H2S, the water would have an unpleasant sulfur taste. Also, without this highly efficient process, sodium hypochlorite would have to be used to react with the H2S and remove the foul taste. This can be costly and also produces more THMs. The city takes much of its water from a wellfield that is several miles from the West Mitchell Hammock facility. 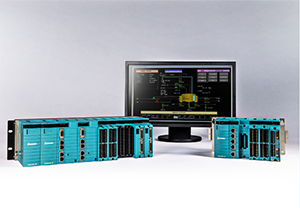 FA-M3 multi-controllers that function as remote terminal units (RTUs) at each well provide an interface to the CS 3000 system at the West Mitchell Hammock facility, and are linked to it via Ethernet radios that operate in the 500 MHZ range. The FA-M3 protocol is used to start and stop the pumps and monitor flow. A number of new wells that are located just one mile from the water treatment facility are connected to its CS 3000 system via fiber optic cable. These use UT55A RTUs and communicate with the CS 3000 system via the Modbus RTU protocol.